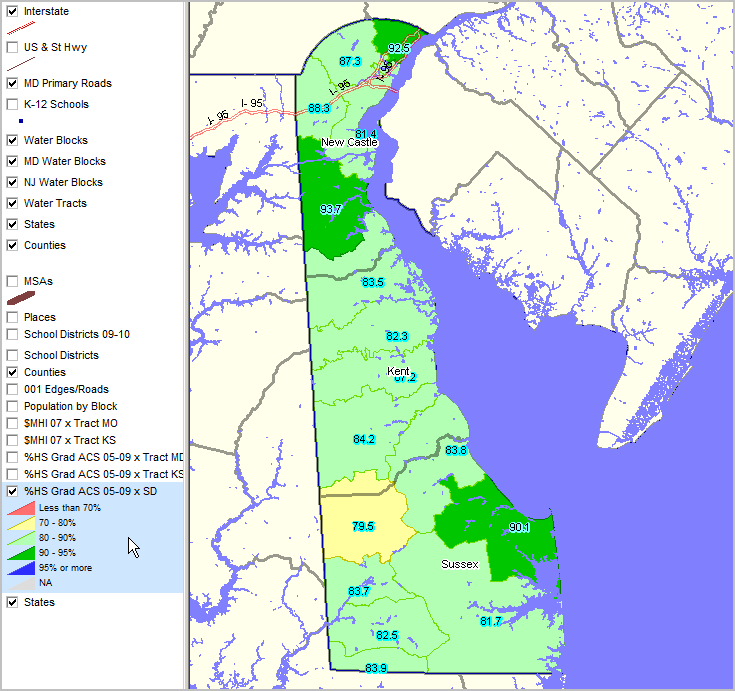 Selected CV XE GIS project/application views in Delaware. Integrating Census 2010 TIGER Shapefiles, ACS 5-year demographics, Census 2010 demographics and related data..
• Delaware school district demographics: http://proximityone.com/sd_de.htm. • Delaware census tract demographics: http://proximityone.com/ustr0509_de.htm. Navigate to sub-state areas: click on expanding text menu in left panel to view available sections. Percent high school graduate (population 25 years and over) by school district. See color code & interval values in blue highlighted layer in legend at left of map view.